Clonil (Clomipramine) belongs to a class of drugs called tricyclic antidepressants. It is used as a treatment for OCD (obsessive compulsive disorder) and the symptoms of this condition, such as repetitive thoughts, compulsions to perform certain tasks, and other symptoms caused by this condition. 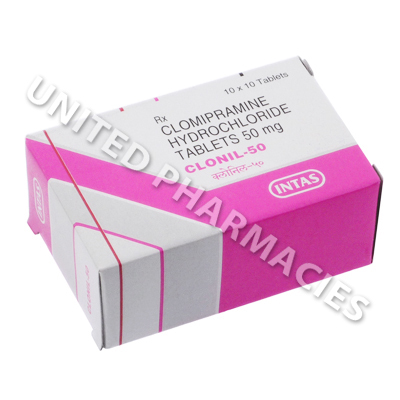 Clonil (Clomipramine) belongs to a class of drugs called tricyclic antidepressants. It is used as a treatment for OCD (obsessive compulsive disorder) and the symptoms of this condition, such as repetitive thoughts, compulsions to perform certain tasks, and other symptoms caused by this condition. This drug works by increasing the quantity of serotonin in the brain, which in turn can help to restore the natural mental balance. Other uses for this drug include treating anxiety, depression or pain relief. 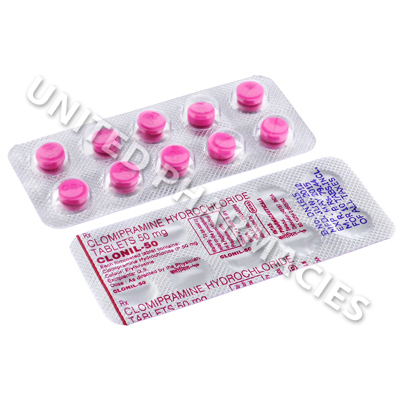 Clonil (Clomipramine) tablets must be taken orally, in accordance with the instructions on your prescription. Ask your doctor if you are unsure. In some cases, patients have been told to take this medication 3 times per day, together with food. This is to allow you to adjust to the medication. Your doctor may reduce your dosage to one tablet per day (taken just before going to bed) after several weeks of treatment. Patients should be aware that suddenly discontinuing treatment with this drug can cause withdrawal symptoms. For this reason, your doctor will probably tell you to gradually reduce your dosage when stopping treatment. It is important to note that in addition to the above mentioned side effects, other side effects not mentioned here may also occur, some of which are serious and require the immediate attention of a doctor. Seek medical assistance at once if you notice pain in the eyes, seizures, muscle stiffness, problems with urination, hallucinations, signs of infection or any side effects not mentioned here. In some patients, especially young adults, taking antidepressants can increase the risk of suicidal thoughts. See your doctor immediately if you experience thoughts of suicide or self harm while taking this drug. Always use Clonil (Clomipramine) as you have been prescribed by your doctor. Never self-medicate or change your dosage without first consulting your doctor. The correct dosage can vary depending on your health, medical history, and the severity of the condition being treated.